WATSONVILLE >> High Ground Organics is perched above Harkins Slough west of Watsonville. When Stephen and Jeanne Pedersen purchased the 40-acre property 14 years ago, one of their first projects was to plant willows, alders and cottonwoods in a drainage ditch as a way to slow runoff and improve water quality in the slough. 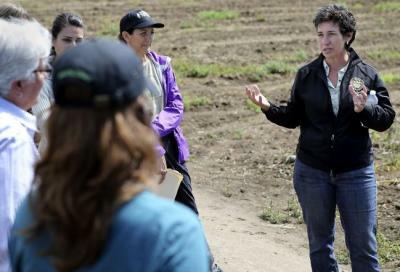 High Ground was one of three organic farms visited Thursday during a tour led by California Certified Organic Farmers and the California Climate and Agriculture Network. Participants included state Sen. Bill Monning, D-Carmel, Assemblymember Mark Stone, D-Scotts Valley, and Assemblymember Susan Talamantes Eggman, D-Stockton, chair of the Assembly agriculture committee. The goal was to show legislators farming practices that can not only help growers cope with severe weather predicted by climate change, but also reduce agricultures contribution to the problem. The legislators also visited Pinnacle in San Juan Bautista and Pie Ranch in Pescadero. The mature trees are just one way the Pedersens have positioned their farm to withstand severe weather, now and in the future. They also plant cover crops on as much as 80 percent of their land each winter and plow it under before spring planting as a way to build healthy soil that can better hold onto moisture during drought and acts to sequester carbon. Read the full story via Organic farm tour focuses on mitigating climate change – Santa Cruz Sentinel.